Eremophila glabra “Kalbarri Carpet” develops into a dense ground cover with a spread exceeding two metres. Foliage is soft and silvery-grey. The tubular flowers are yellow, rich in nectar and form a ring around the stems at the base of each leaf. Blooms are profuse, conspicuous and appear in spring and summer. The leaves and flowers form a stunning living carpet. Spent flowers cover the ground around the plants. Tip prune to improve foliage density and flower production. This beautiful ground cover could be grown in rockeries, spilling over a retaining wall or near a walkway. “Kalbarri Carpet” probably originated in the Kalbarri area, north of Perth, Western Australia. 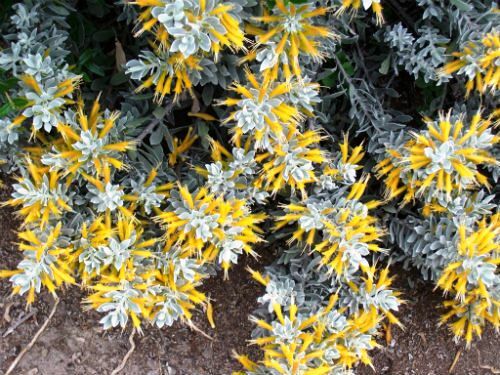 This cultivar, as with most Eremophilas or Emu Bushes, propagates rapidly from cuttings.